Why are left-turn arrows so short in Chicago? 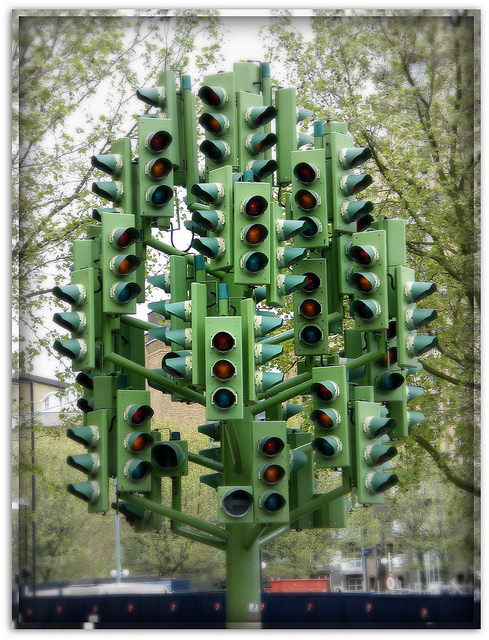 A traffic light sculpture in London. We cannot tell whether this works on an actuated or fixed time system. Why are the vast majority of the left hand turn signals in the city of Chicago only on for less than 10 seconds? Admittedly, he threw this question out there as a lark, knowing that Curious City is all about answering questions posed by the public, not by WBEZ staffers. But, this being his last week at the station before taking up a new gig — and, given that he’d be in the listening “public” soon enough — we thought we’d break that rule just this once and surprise him with an answer. Actuated systems: These use sensors and cameras to adjust the timing of lights and signals based on real-time demand.” Basically, when cars pull up to traffic signals, the signal has a way of knowing where they are and what they want to do. For instance, if there are a bunch of cars in a left-hand turn lane, computers will consider turning on a timed left-hand turn signal. Non-actuated / Fixed time systems: These systems turn lights and signals on or off in a specific, hard-coded sequence that doesn’t respond to drivers on the ground. If a bunch of cars are waiting in a left-turn lane, the computer doesn’t consider how to make the drivers’ lives easier: It keeps to the specified schedule of signals — no matter what. Spedale explained each system has its place and serves a purpose. “The immediate downtown grid is gonna be a fixed-time system. Because an actuated system just will not work. There’s just too much volume and not enough spacing,” he said. If stoplights worked on-demand downtown, he said traffic would be far more chaotic than it is already. To further illustrate the point, he talked about a photo he has in his office, which is a view looking down State Street. It shows a series of lights (all green), lined up into the distance. This fixed-time system is what’s responsible for lights all being green or all red at the same time on the same street. That coordination allows higher volumes of traffic to move through the most crowded city streets. The downside? Turn lanes and less-trafficked roads get short shrift. Scales pointed out that some lights are timed to accommodate far more drivers wanting to make turns. “The longest left-turn green light is 80 seconds for southbound Ridge and Hollywood during the rush hours,” he said. Chicago has a mix of actuated and fixed time systems, with the actuated traffic controls being used outside of the main downtown grid. Just call that magic number: 311, but pull over first.